Then Sunday arrived, overcast, gloomy, and Halloweenish. The chill in the air announced that it was time to head up to the mountains for our annual apple picking. It's a family tradition. Apparently, judging by the hundreds of families on the mountain, it's not an unique tradition. This year, for instance, our family expedition grew. Tyler's sweet girlfriend of a year, Val, joined the party. It's good to have more female companionship! 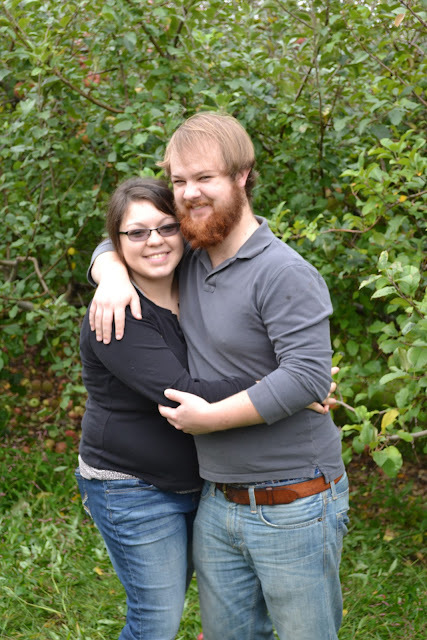 And Tyler sports a serious mountain man beard. Traditionally, we visit the orchard on a gorgeous day, enjoying breathtaking views of the 60 acres of apples, pears, peaches, and cherries. This year, dense fog blocked my photo ops. 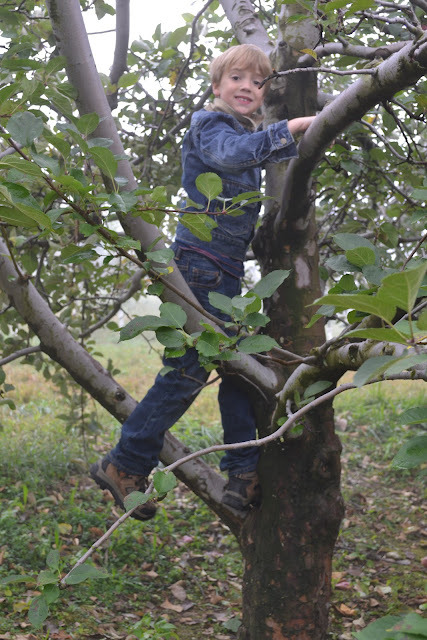 Typically, we walk to the far back section of the orchard in our quest for the perfect apples. Then we walk...and walk...and walk...back to the store, little legs complaining about the distance and little arms too tired to carry the full baskets. This year, we broke tradition—but only because few varieties remained to be picked. 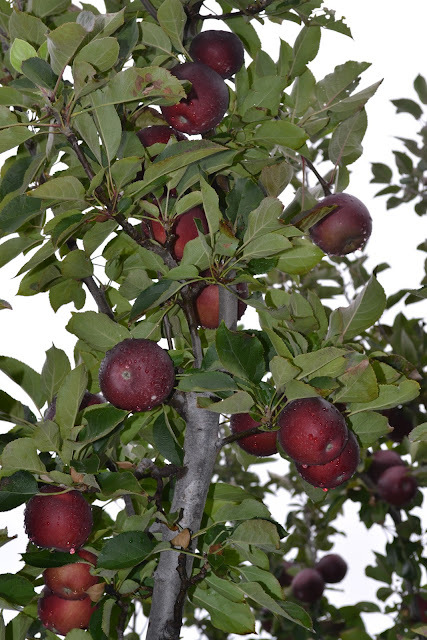 Most of the trees were bare, with their fruit prepackaged and ready to purchase in the store. 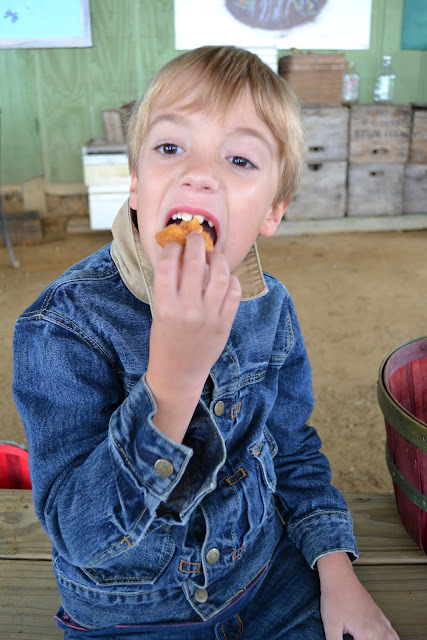 We found a few rows of trees, picked a few baskets of apples, and then bought the other required varieties in the store. 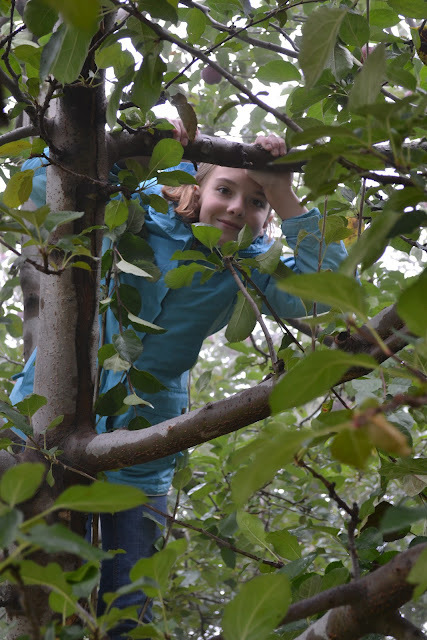 Traditionally, apple picking is a time that kids can run free in the orchard, with us keeping an eye on them. 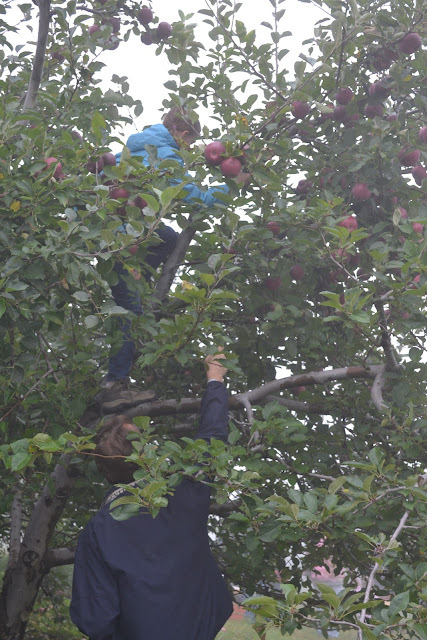 Watching kids have the freedom to play hide-and-seek among the rows, to climb a tree to pick the prettiest apple, to taste a just-picked fruit at its freshest—those are traditions I cherish. This year, we were greeted with rules:No climbing trees. No eating apples.No riding on wagons. Honestly, I understand people can be thoughtless. 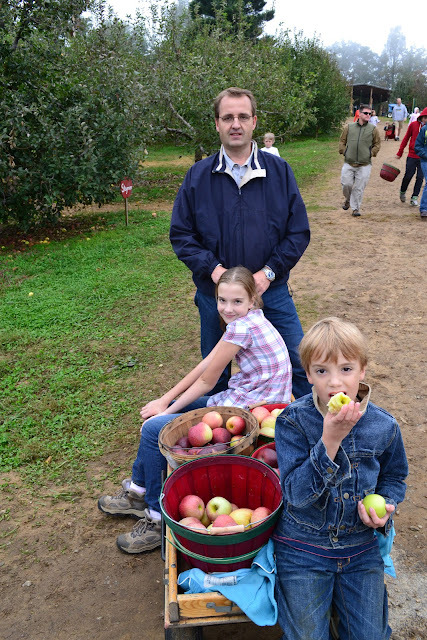 After all, this orchard is the livelihood for a family, and visitors need to treat it with respect. Still, it made me a little sad that the owners needed to post rules, like “No throwing apples.” Shouldn't that be commonsense? 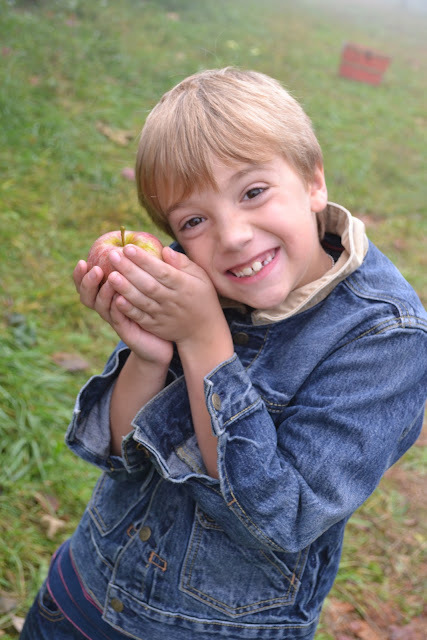 ...and to take a cheesy photo with the just-picked apple. 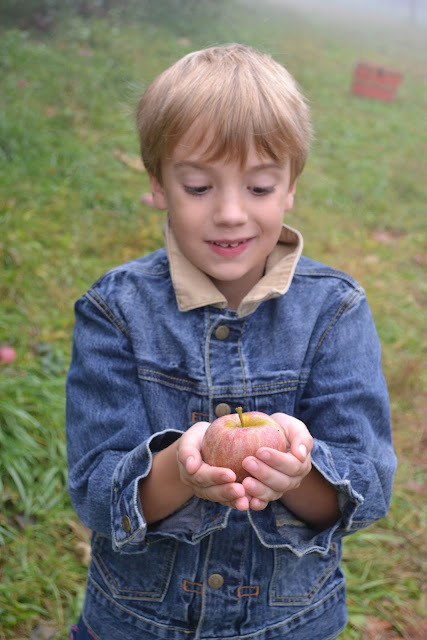 And it's a tradition for the kids to whine a bit when carrying their apples back to the store. This year, we wised up and used a wagon. You can see some traditions never die! 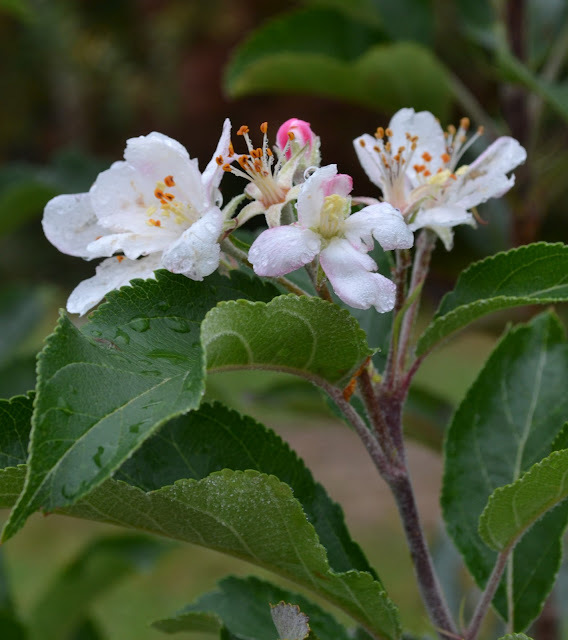 It's definitely not a tradition to find apple blossoms in October...poor, confused tree. Apparently, it's become a tradition to buy a ridiculous amount of apples. We now have several bushels of apples residing in our refrigerator. Fuji, Granny Smith, Golden Delicious, Cameo, Arkansas Black, plus a small bag of Asian Pears...all waiting patiently to become culinary delights. A final tradition of the day: the season's first apple pie. When the first semi-cool day arrives, Kristen requests apple pie—and hot chocolate. It's a fall tradition. She's actually been asking for both since October 1. Now, with the temperatures requiring sweaters, it's time to make my girl happy. I must admit—I cheat. I'm sure I'll lose all credibility admitting this--but I use a prepared pie crust. I remember too vividly my mother's anxiety over making pie crust. She always fretted that it wouldn't be right. I don't know why she worried—it was consistently delicious. Still, I think her worry causes my hesitation to prepare homemade crust. We have so many apples, though, that perhaps this will be the year I attempt to make a pie crust from scratch. But after a long day of apple picking, I chose the easy route. Heat oven to 425°F. Place 1 pie crust in ungreased 9-inch glass pie pan. Press firmly against side and bottom. In large bowl, carefully mix filling ingredients and place in crust. Cover with second crust. Tuck excess top crust under bottom crust edge, pressing edges together to seal. Flute. Cut slits in top crust. Bake 40 to 45 minutes on middle rack in oven until crust is golden brown. After 25 minutes, place a sheet of aluminum foil on top of crust to prevent burning. Cool at least 2 hours before serving. Because I tend to be overzealous when peeling apples and fill my pie crust a little too full, I always place a cookie sheet on the lowest bottom rack in the oven to catch spills.